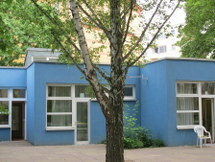 The center of the Berlin section of the German Life Saving Association (DLRG) was built from 1969 to 1971 by the German architect Ludwig Leo. The 30-meter high triangular tower is presented towards the street front as a powerful block in rust-colored concrete wall with lateral sides, crowned by.. 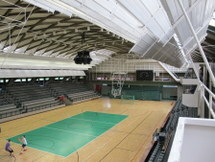 Shortly after the erection of the Berlin Wall in 1961, the government of West Berlin commissioned the largest post-war gymnasium. Construction started on March 16th 1962. 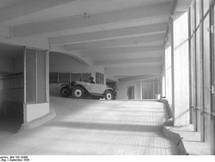 The architect Ludwig Leo opted for a complex, but elegant 52-m free-span reinforced concrete vaulted ribbed vault. A couple.. The Reichsknappschaftshaus (House of the Reichsknappschaft) is an office building which was originally conceived as an administrative building for the social security and health insurance institution of German miners. 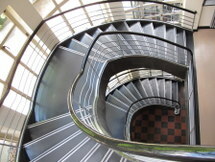 It was built built between in 1929 and 1930 by Max Taut and Frank Hoffmann in.. 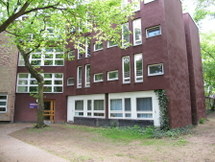 The student housing complex in Eichkamp in the suburbs of what later was to become West Berlin was one of the first student accommodations to be built in post-war Germany. 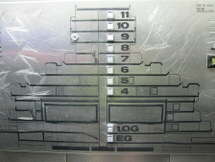 The architects started to work on the project when they were still students. In the beginning they had no funding,and they.. 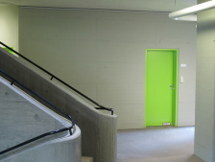 This kindergarden built for the city of Berlin is the second major public commission of architect Ludwig Leo. Again this public building shows the architect's aim to introduce new architectural forms and concepts to postwar German architecture. 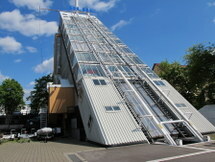 The open and flexible one-storey format of the.. In the 1970s West Berlin encircled by the GDR feared to run out of space for new residential housing developments and a concept to build housing superstructures on top of motorways was born. 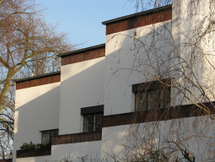 The Berlin architect Georg Heinrichs was commissioned to design the first of six superstructures to be..
Schorlemerallee is a boulevard on the outskirts of Berlin, in the district of Dahlem. It was originally planned in 1901 as 'Street 35' as a street with a settlement of villa-like houses, but only when a subway station was built nearby in 1911, the construction really started. This research centre in Berlin by the architects Fehling + Gogel from 1965 to 1974 was realised in close cooperation with the institute's research staff. The briefing document was more than 100 pages long and the architects took care to create an environment that allowed the research staff to.. 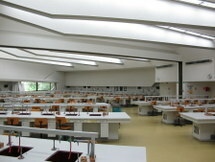 The Insitute for Hygenics and Microbiology was designed by the Berlin architects Fehling and Gogel.